The second game of my PITT07 *PLUS* group where I add people with really good games. 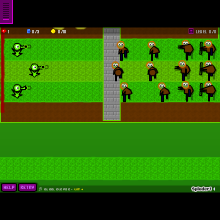 For this game you must survive an endless wave of zombies without letting them past your lawn. The objective is to collect 15 sun produced from the sky or from your one sunflower. Click to shoot your peashooters at the zombies. Have fun!